Choose from any of our over 3,000 frames including: Cazal, Caviar, Diva, Polo, Saks Fifth Avenue, Christian Dior, Tommy Hilfiger, Versace, Liz Claiborne, Bebe, Nicole Miller, Dakota Smith, Essence, Sophia Loren, Stetson, Hart Schaffner and Marx, Daniel Hunter, Harry Potter, Joop, Elle, CEO, TitanFlex, Batali Flex, Cover Girl, Clint Eastwood, Izod, Esprit, Flexon, Apple Bottoms, Dockers, Carmen Marc Valvo, Laura Ashley and many many more. For additional frame information please see our frames page. 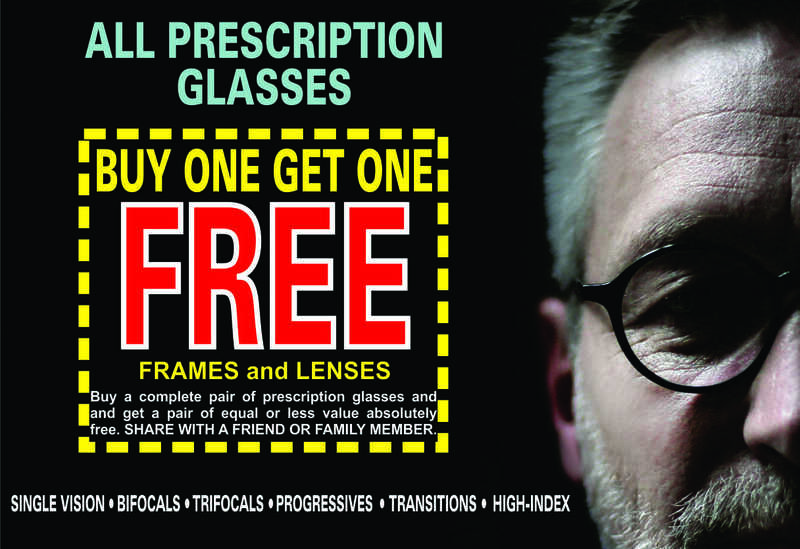 AN IMAGE OF THIS COUPON MUST BE PRESENTED TO THE OPTICIAN AT THE TIME OF PURCHASE. Offer not valid with insurance or other special offers.